Forest Scouts is my latest painting for the Bird Whisperer Project. 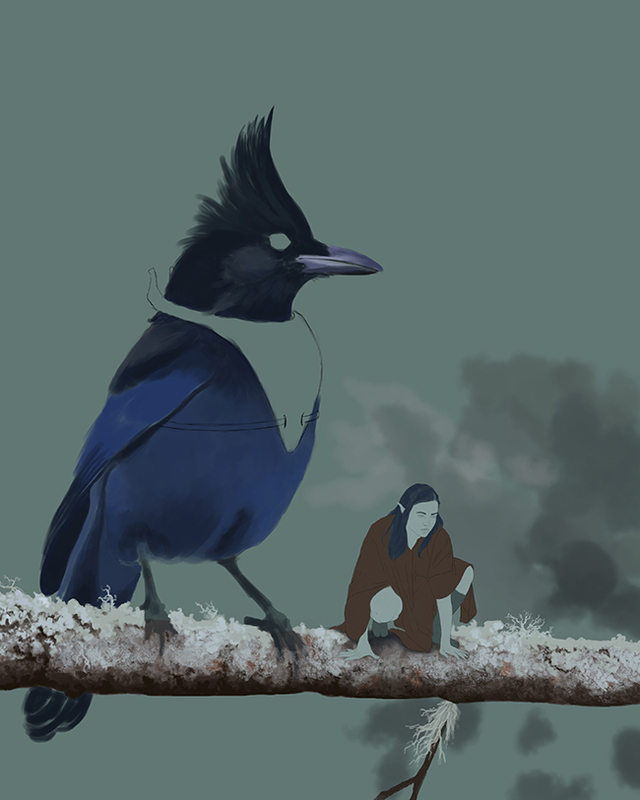 I knew from the moment I saw the reference photo for December’s bird, a stunning Stellar’s Jay, that he would become part of a fantasy world. I envision him and his little rider as part of a team of scouts that keep watch from the tree tops. As you can see, I took my inspiration from the reference photo but it’s far from a copy. I always try to focus on capturing an essence instead of being exact. My goal is to transform what I see in the reference photo into my own vision. Here’s a process gif, showing the evolution from drawing to finished painting. Digital painting can seem like magic, but in some ways it’s no different than any other painting medium. You have to do the work. These were the main brushes I used for this painting. I don’t tend to use many—you don’t need many. If I’m working on a watercolor or an acrylic painting, I use about the same number. These are brushes I use in all of my digital work. All of my digital paintings begin with a drawing. I like to have the reference photo open in Photoshop alongside my canvas. Then I pick up my stylus and begin drawing with my Wacom Inutos. Here are 5 process shots I took from the GIF image above (you can click on the first one and scroll through them). Besides filling in the background with the paint-bucket tool, everything is painted by hand. The more detailed the painting, the more realistic I want it to be, the longer it takes. I like to block in basic colors and then I try to focus on the background first. When I need a break from that I start focusing on other parts. There are usually parts of my drawing that I keep simplified, especially when it comes to bird feathers. I prefer to focus on these as I paint. Here’s a look at that with this month’s Stellar’s Jay. As you can see, it’s still not exact, just my own interpretation—an essence. Sometimes, I have to take a break from the most tedious parts so I don’t lose focus. More often than not, when I return to them I see something I missed or want to change. I’m hoping in 2019 to begin recording my painting process—snippets of it at least. Then you can see paint in real time. Stay tuned! Harbinger (left) and Raven Queen Rising (right) were painted only months apart in early 2017. I'd like to say this was planned in advance, but sometimes my subconscious gets the better of me and I paint on auto-pilot. It was only after the Raven Queen was finished that I realized what I'd done. 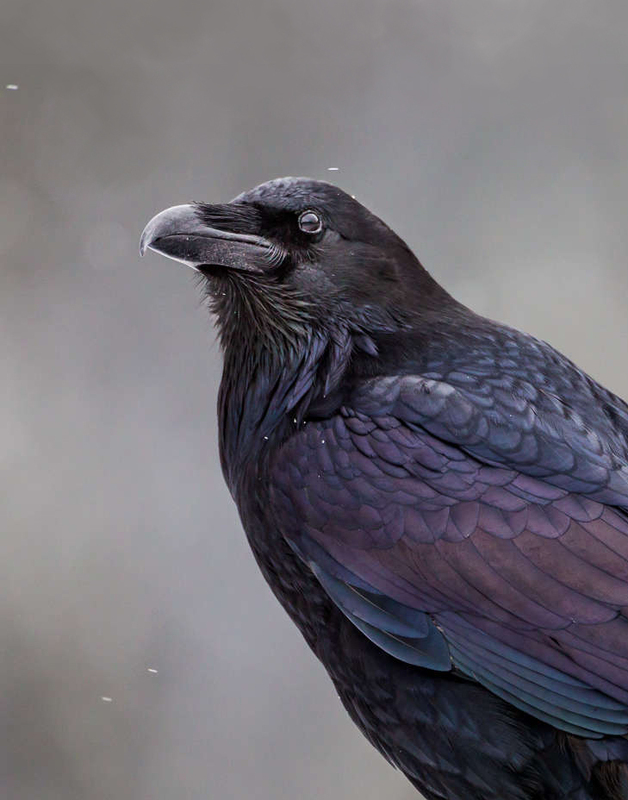 Many of the colors seen in the raven's wings are echoed in the Raven Queen, especially in the background. She herself, is pale like the skull the raven wears around its throat. The two paintings depict the same being in different moments of time. Though traditionally Morrigan is associated with crows, I decided to stay with the raven. I couldn't get the idea out of my head--the idea of this goddess going into battle only to say, "No more war." I saw her rising up into the sky to shed her corvid form, to break free from her own mythology. I like to think the goddess might be appalled by the wars of the modern world or maybe she's just grown tired of humankind's lust for blood. Toward the end of 2017 I decided to take a look at this drawing again. I don’t often return to pieces I’ve finished, but this one was calling to me. I’m glad I listened! I used a combination of Tombow Mono pencils and a 2B mechanical pencil to help smooth and fill in some of the amazing texture on this paper, bringing more depth to the shadows and intensity to the drawing. I realized after comparing these two images that I'd been lazy, or most likely busy so I rushed her the first time around. Now she is finished and you can tell. This is a good example of why it's important to set a panting or drawing aside for a short time. It's important to distance yourself, even if only for a day or two, to regain perspective. When you've been staring at a piece day after day for a week or more the chances of missing exponentially increase! I've been asked a couple times and it's true, I used my own witchy face as the inspiration for this portrait. I wanted something between the recent photo of me on the left and the younger me on the right. The next seer portrait, Owl Sight, will feature my daughter. I'm calling these the Blood Mountain Seers, named after my favorite mountain in North Georgia. More than a few people mentioned they thought it was the photograph, but seeing them side by side, I think you can see the differences. If I hadn't been in such a rush, I would have taken more detailed process shots as I went. Hopefully, what I do have will give you a peek inside my process. I don't use many. I have about 10 favorites, but more often than not I'll only use 5 for any painting. Here are the brushes I used for Winter Raven (Harbinger). The first brush is one of the basic soft brushes that come with Photoshop. I also use the hard one, usually for sketching out my subject. The fourth brush is often the brush I use for blocking in the basic colors. All of the feathers were painted with the second and the fifth brush. Just like traditional brushes, any of these can be large or small in diameter. Having my reference materials nearby is always handy, but when I'm working in a realistic manner I do like to have it extra close. I'll pop it out of the window and keep it on top in Photoshop. With that said, I don't need all of those feathers to be precise for the end result to "look" real. You can see some of my sketch above--those wing feathers are pretty off! The screenshot below shows different stages of the raven's head. Once I blocked in the base color, I used the same brush for all of the feathers--only changing the size of the brush and pigment as I went along. In some areas, like the cheek, the brush was very, very small! The pressure I applied also varied. For the neck feathers I need stronger brush strokes compared to the softer parts of the head. Sometimes, one small element can transform a painting's narrative. In the case of this raven, it was a squirrel skull pendant. Ravens don't wear pendants, meaning we've entered the world of fantasy and most likely magic. I wanted viewers to create their own story for this harbinger. The reference for the skull came out of my personal bone collection. Yes. I have a bone collection. I decided to photograph the skull at the angle I needed to limit the chances of damage. Above you can see the different stages of the the skull--from rough sketch to basic blocking in and refining of shape, and the last being a more rendered version. Prints for Winter Raven and Harbinger are available in my shop!